This tutorial is suitable for use with a screen reader. It explains strategies for solving simple multiplications in your head such as 6x4. Work through sample questions and instructions explaining how to break up numbers into their factors. Solve multiplications by using arrays to break them up into rows and columns, then solve the main equation. This learning object is one in a series of two learning objects. Students use arrays to work out products mentally. Students investigate the commutative principle. Provides definitions of ‘row’, ‘column’ and ‘array’. 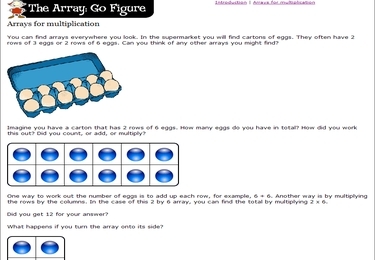 Provides real world example of an array to illustrate multiplication principle.